1. We want our planners customized for us. 2. We want our planners to work for us, focusing on our goals and needs. 3. We must write it down in order to get it done. With this is mind, we have assembled here some of our favorite DIY items. Some are ideas we developed ourselves, while others are concepts taken and adapted from friends and colleagues. Feel free to twist, tweak, shift, change, or reinvent these ideas to suit your own personal needs. After all, that is the whole point! Pro Tip: Most people simple look at our images for inspiration, then re-write or re-draw them by hand into their own journals and planners. If you would rather print an item and glue it in, that's your choice. If you don't want the bumps of glue (and you like crafting stuff), you might want to consider getting a basic sticker maker, like the Xyron. 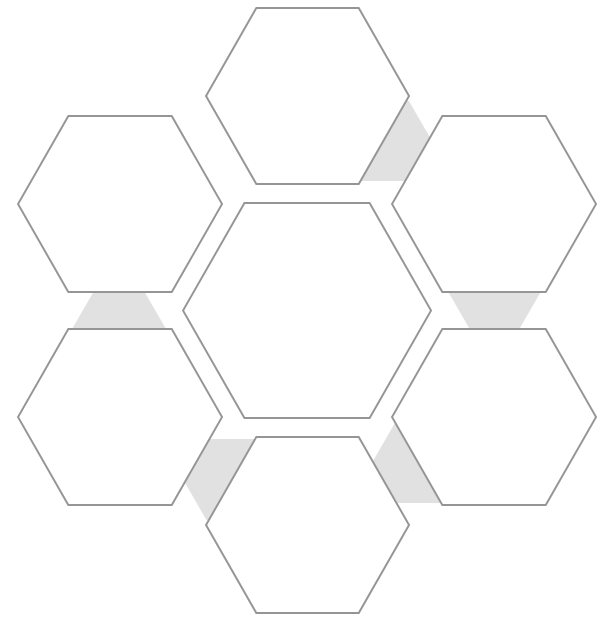 A hexagon design is useful for setting weekly reward goals. There are six sides/spaces for charting the tasks which have to be completed. Once the six outside pieces have been checked off or colored in, the center piece reward is given. For example, maybe you draw a dumbbell on each of the six outside hexagons, to encourage you to exercise Monday through Friday. In the center hexagon, you draw an ice cream code to represent your reward on Sunday. While this is perfect for weekly six-days-work, seventh-day-relax rewards, there's no rule saying you absolutely must use it this way. If you skip the gym on Wednesday, and push your reward back to Monday, so what? The principle is the same--you have to put in six tasks in order to earn the reward. This can also work for parents and kids. Print the image and put it on the fridge. Monday through Saturday, or Sunday through Friday, your child writes down what helpful tasks and chores she or he completed. "Monday--walked the dog and washed the dishes." "Tuesday--took out the garbage and recycling." Once the circle of hexagons is filled up, mom or dad gives a reward. Maybe, in the center hexagon, your child requests a privilege! "I'd like to get a new outfit for the dance." 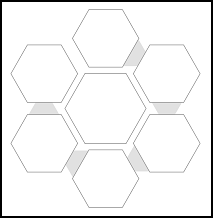 Click here for a PDF sheet to print which has four of these hexagon trackers (all blank for you to fill in). Do you or your students like to track the books you've read? Drawing a simple bookshelf is a fun way to do this. Best of all, you don't have to be good at drawing. This can be made with a ruler (if you want perfection), because the shelves and books are made from nothing but straight lines. You can list books you've finished, or jot down the names of books you plan to read. You could even have separate bookshelves for each list. Teachers might create a giant version of this for the classroom door, to display all of the books and stories the class has read as a group. Students and parents will be able to watch the bookcase fill up over the school year.